Metsamor 2 of the in Armenia will shut down on 1 June for a substantial repair and upgrade outage, Gera Sevikyan, chief advisor to the plant CEO, said on 20 March. The repair will last 110 days compare with the usual 45 days for preventative maintenance. Sevikyan said the generation gap would be filled with the electricity generated by hydropower and other plants. Metsamor a 400MWe Soviet-era VVER-440 reactor provided around a third of Armenia's electricity. After the modernisation, the capacity of Metsamor 2 will increase to 420MWe in 2021 and then up to 450MWe. The reactor upgrade project is now in its third year, which will be the most challenging as key systems in both reactor and turbine are being modernised. 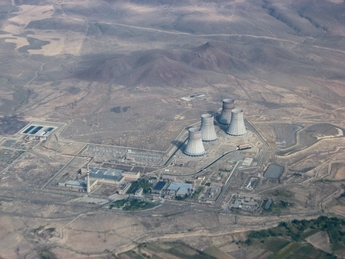 The two-unit Armenian nuclear plant, located at Metsamor, was built in the 1970s but was closed following an earthquake in 1988. However, Metsamor 2 was restarted with Russian assistance in 1995 in the face of severe energy shortages. The Armenian authorities planned to build a reactir to replace the ageing facility, but the project has faced financial and political difficulties. In 2014, the government decided to extend the plant’s service life to 2026 because of delays in building the new unit. The extension was made possible by a Russian loan of $270 million and a $30 million grant. Baghramyan said that the Ministry of Finance had asked Russia to extend the repayment period of the $270 million loans to 2026.